The Inala Indigenous Health Service aims to promote, maintain and improve the health of Aboriginal and Torres Strait Islander people by offering culturally appropriate health care. In mid 1995, Wakka Wakka and Kalkadoon man Dr Noel Hayman and nurse Nola White, descendant of the Ghungalu clan, were asked by Queensland Health to set up an Indigenous health clinic as part of the Inala Community Health Centre. At the time, only 12 patients at the clinic identified as being Aboriginal and/or Torres Strait Islander, and our first year involved fewer than 900 GP consultations. Our service rapidly expanded every year; we currently have more than 6000 patients who attend 20,000 doctor consultations each year. In June 2013, after 18 years located in the Inala Community Health Centre, we moved to the purpose-built Centre of Excellence, pictured above. Our clinic has a strong focus on preventative health, and our nurses and doctors complete about 1000 health checks each year. Since the child health check program began in 2006, our service has been responsible for about 10 percent of all of Indigenous child health checks done in urban Australia. We believe that to 'close the gap' in health between Indigenous and non-Indigenous people, we need to look at preventing chronic illness developing, rather than just treating illness after it occurs. 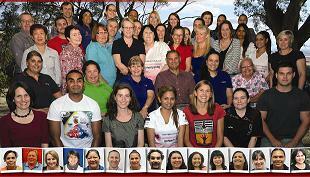 We started as a GP clinic, but in 2013 our 50 staff members work in many areas. A visit to our clinic might involve a dietitian, psychologist, social worker, midwife, chronic disease educator, male or female Aboriginal health worker or a nurse using our retinal (eye) camera. Regular visiting specialists include a paediatrician (kids), cardiologist (heart), endocrinologist (diabetes), ophthalmologist (eyes) and gastroenterologist (liver). We also work in the community, providing an outreach immunisation service, sexual health education, a book-reading program for pre-schoolers, nutrition classes, and a variety of chronic disease prevention programs. Dr Hayman published his first research into the health of our patients in 1998, regarding infant nutrition. It became clear that 'closing the gap' in health requires knowledge as to what works and what doesn't, yet a lot of this evidence is lacking. The dramatic increase in our research projects and publications in medical journals led, in 2010, to the appointment of a Research Director and the formation of Australia's first Community Jury for research. After years in the planning and 15 months in the building, we moved into our new Centre of Excellence in June 2013. The new clinic allows expansion of every aspect of our service, including the clinic, teaching and research. It also becomes an important teaching centre for students and the next generation of doctors, nurses, dentists and allied health professionals.